I turned thirty a few months ago. Turning thirty does a lot of things to one’s psyche. You realize that you’re not a kid anymore. You realize that you’re starting to get old. That’s why I decided to start taking vitamins. I figured as long as I’m going to smoke, drink, and party, I might as well take vitamins. Delay the inevitable and all that jazz. 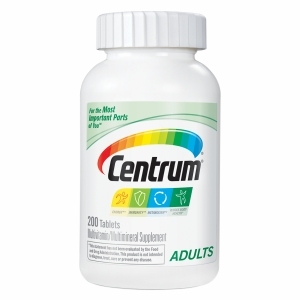 So I bought a giant bottle of Centrum Adults Multivitamin. I’ve popped a pill everyday since the end of April and I haven’t gotten sick since. I don’t know if that means they are working or if I was just lucky, but I want to assume that it’s the Centrum. It’s got all the vitamins and minerals that my body needs (at least according to the government). Taking vitamins can’t be detrimental to my health, so I think I will keep up the habit for a few more years at least. This might seem like a shameless plug for Centrum, but rest assured they didn’t pay me. I only needed something to write about and I saw my bottle of Centrum on the dresser. I’ll stop talking now.